The global RFIC market is growing at a CAGR of 8.4% during the forecast period due to the increasing demand from emerging economies, increasing adoption of IoT solutions and increasing internet penetration across the globe. The RFIC circuits are extensively being utilized for performing functions such as signal filtering, frequency conversion and amplification. On the basis of product, the RFIC market is segmented into transceivers, wireless USB, Wi-Fi, ZigBee, NFC, bluetooth, RF MEMS, Wi-MAX, power amplifiers, mobile TV, GPS, and others. Among all of these segments, power amplifiers hold the largest share in the market. Moreover, it has been observed that transceivers are expected to witness significant demand during the forecast period due to increasing requirement of small multichip packaging for small electronic devices. Increasing utilization of latest technology such as internet of things (IoT) in emerging economies is the key factor that is driving the growth of the RFIC market. The increasing utilization of internet has stimulated the service providers across the globe to provide internet with high speed and higher bandwidth. The increasing growth of wireless communication market is also supporting the growth of the RFIC market. The excessive adoption of wireless systems in healthcare industry is performing significant role in transferring of information in an effective manner. Additionally, prices of wireless spectrum in China and India is driving the demand of high bandwidth wireless communication systems, thus driving the growth of the RFIC market. The lack of international standardization is the major factor hampering the growth of the RFIC market, across the globe. Moreover, high initial cost pertaining to setting of RFIC system also restrains the RFIC market growth. Globally industry players are leveraging market growth through establishment of long-term contracts with business partners. This is helping the business organizations to develop new innovation strategies and increase their overall revenue, thus, enabling the vendors to expand their market base across the globe. Geographically, Asia-Pacific is the largest RFIC market across the globe and is also predicted to witness significant growth during the forecast period. The presence of large number of OEMs in the region, increasing internet penetration, and increasing automation in supply chain management are leading to the high demand for RFIC technology in the region. The RFIC market in Latin America and Middle East and Africa will also witness significant growth in the coming years owing to the large unexplored territories and developing information and communication technology infrastructure in the region. 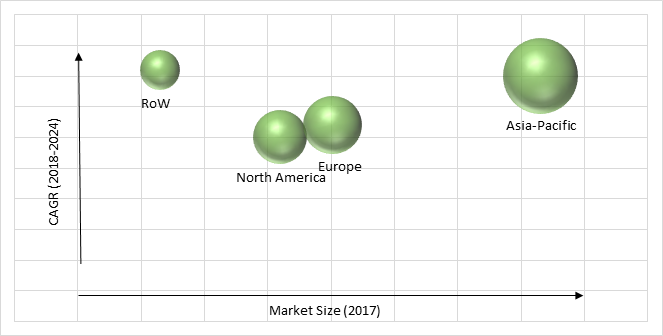 The key players operating in the RFIC market include Infineon Technologies AG, TriQuint Semiconductor, Qualcomm Technologies, Inc., Skyworks Solutions, Inc., NXP Semiconductors N.V., Silicon Laboratories Inc., Avango Technologies, STMicroelectronics NV, and Renesas Electronics Corporation. Table 100 Snapshot – Qualcomm Technologies, Inc.
Table 101 Snapshot – Skyworks Solutions, Inc.
Table 102 Snapshot – NXP Semiconductors N.V.
Table 103 Snapshot – Silicon Laboratories Inc.